Page	Introduc>on………………………………………......... I	Map	of	Historical	Treasure	Hunt................... Centerfold	Cluster	1	1. 3799	McLaughlin…………………………………..	1	2. 3853	Minerva……………………………………….. 3	3. 3930	Marcasel………………………………………. 3	4. 3940	Marcasel……………………………………....	4	5. 11831	Atlan>c........................................... 5	6. 4124	East……………………………………............ 5	7. 4151	Marcasel……………………………………….. 6	Cluster	2	8. 3638	Grand	View……………………..........……. 9	9. 3504-­‐08-­‐16	Grand	View…………………………. 11	10. 3609	Ocean	View…………………………………… 13	11. 3616	Ocean	View....................................... 13	12. 3701	Mountain	View……………………………… 14	13. 3628	Mountain	View……………………………… 15	14. 3664	Mountain	View……………………………… 16	15. 3543	Inglewood	...………………………………..... 16	16. 3581	Mountain	View………………………………. 17	"
WalkIt! 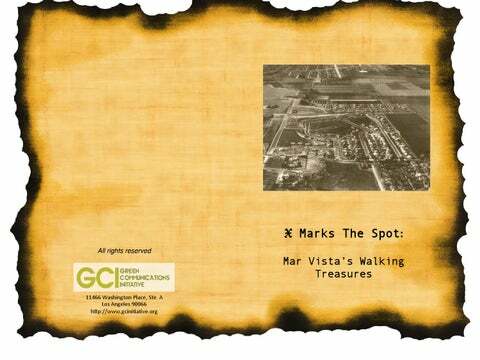 Mar	Vista	Historical	Tour	credits:	WalkIt! treasure	hunt,	layout	and	brochure	-­‐	Green	Communica>ons	Ini>a>ve	(GCI)	Wayfaring	Street	Signs	–	Art	Watanabe	For	more	info	and	to	to	take	the	WalkIt! Pledge,	go	to	GCI’s	WalkIt! 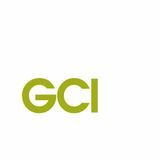 GCI	would	like	to	thank	Councilman	Mike	Bonin	and	his	staﬀ,	the	Mar	Vista	Community	Council,	and	the	Mar	Vista	Green	Commi9ee	for	their	support	and	the	beau>ful	Green	Garden	Showcase.	" Top	photos:	site	of	the	newly	installed	sustainable	garden	in	front	of	LADWP	Distribu;ng	Sta;on	No. 59	BoVom	photo:	Mar	Vista	resident	enjoying	the	garden. This	aerial	view	(note	the	;p	of	a	plane	wing	on	the	right)	shows	the	street	in	front	of	a	house,	running	leX	to	right,	on	what	is	now	Venice	Blvd. The	street	at	leX	of	photo	running	top	to	boVom	is	present-­‐day	McLaughlin	Avenue. Today	this	corner	is	dominated	by	the	cement	storm	channel	built	in	1951...and	the	DWP. Film composer Christopher Young owned this house from 1997 until his divorce a few years later. In Hollywood since the early 80s, the prolific Young has provided music for over 80 films, including Hellraiser, Spider-Man 2 and 3, and Somethingʼs Gotta Give." 3853	Minerva	"Academy Award-winning cinematographer William H. Daniels is the most famous resident of this house. Starting as a $12-a-week assistant cameraman at Triangle studio in Culver City, Daniels worked on several of Erich von Stoheimʼs great silent films, including Greed and The Merry Widow. He signed an exclusive contract with newly-formed MGM in 1924 and worked at the Dream Factory for twenty-four years. He shot 19 of Greta Garboʼs 22 American films, including The Torrent, her first, and Ninotchka, her next-to-last. He also photographed the first important films of Clark Gable, Joan Crawford, Jimmy Stewart, and Glenn Ford. Daniels won his Oscar in 1948 for Naked City and was nominated three other times. It is not certain exactly how long Daniels lived in his modest 1924 Mar Vista home. The 1930 census shows that he was renting the house (and employing a live-in maid) by that year, and in 1940 he bought the place only to sell it three years later. He died in Hollywood in 1970." Character actor Eric Blore owned this house during the early 50s. The English-accented thespian appeared in some 100 films from the 20s through the 50s, often playing a sardonic butler, a role he played for stars like Joan Crawford, William Powell, and Joel McCrea. He also provided comic relief in four of the Astaire-Rogers musicals of the 1930s. " 4124	East	Blvd. This massive house was built in 1910 near the Hancock Park/Windsor Square neighborhood and moved here in 1927. From 1939 to 1993 it was the home of Al Jennings, a prolific second unit and assistant director at MGM. During his 30-plus years behind the camera Jennings worked with such major stars as Judy Garland, John Wayne, Jane Fonda, Kirk Douglas, Myrna Loy, Marlon Brando, and Elvis Presley. Among the better-known films to which he contributed are Annie Get Your Gun, Where the Boys Are, Point Blank, and Deliverance. During the 1930s and 40s Jennings had a stable of horses on this property. Recently deceased Margaret Coulter of 4227 East use to recall the time that one of his horses galloped over her newly (circa 1939) laid out lawn, always a good way to get to know your neighbors." Historic	Mar	Vista	Cluster	1	1. 3799	McLaughlin	2. 3853	Minerva	3. 3930	Marcasel	4. 3940	Marcasel	5. 11831	Atlan>c	6. 4124	East	Blvd. 7. 4151	Marcasel	Cluster	2	8. 3638	Grand	View	9. 3504-­‐08-­‐16	Grand	View	10. 3609	Ocean	View	11. 3616	Ocean	View	12. 3701	Mountain	View	13. 3628	Mountain	View	14. 3664	Mountain	View	15. 3581	Mountain	View	16. 3543	Inglewood	"
3638	Grand	View	This large Craftsman house at 3638 Grand View was built in 1911 by attorney John L. Fleming. It has an outcrop on the right side of the house, a bay window on the left, and above this a fancy balconet. Also on the left side can be seen traces of a now-missing chimney that was felled by the 1994 Northridge earthquake. An original stained glass window adorns the back wall of the front room. " Born in Downey in 1876, Fleming began practicing law in 1900 and became a Los Angeles Superior Court judge in 1914. He was appointed advisory counsel to the original Mar Vista Chamber of Commerce in October 1924, and two months later opened the first gas station in the area, the Mar Vista Service Station and Garage, near the northwest corner of Venice and Grand View. He became president of the Mar Vista State Bank in 1927, the first financial institution established in the community. The bank was located in the Stohl Building, which still exists at the northwest corner of Venice Boulevard and Colonial Avenue. " •  "
In 1923 Judge Fleming tried a divorce case involving legendary silent screen star Barbara LaMarr, the most scandalous actress of her time. During an age when a divorce could brand a woman scarlet, Barbara went through five husbands before her druginduced death at age 29. This Hollywood jezebel seems to have broken up a few marriages as well: in the divorce proceedings in which she appeared before Fleming she was “the other woman”. " " The Judge was no stranger to controversy himself. In 1931 he resigned as bank president during a receivership scandal. And charges of professional impropriety were leveled against him several times during his 19 years on the bench. In 1933 he was recalled from office for improper influence on a trial involving Pauline Starke, another Hollywood silent starlet. " 3504/3508/3516	Grand	View	The first structure of any significance built in Ocean Park Heights was erected on the southeast corner of Palms and Grand View: a large water tank atop a wooden derrick. Completed in the summer of 1904 by the Ocean Park Heights Water Company, this reservoir was filled with well water by a small pumping station and distributed throughout the neighborhood via gravity-fed feeder lines. The pumping station was enclosed in a structure designed to look like a miniature Spanish Mission church, complete with domed tower. In the uncomplicated early days of the last century, residents of Ballona Valley who didnʼt have their own wells got their water from private water companies like the one who owned this one. For some obscure reason water rates were regulated by the State Railroad Commission. In 1929 the Southern California Water Company constructed a giant 2.2 million gallon-capacity reservoir on this corner. It provided water not only to Mar Vista but had pipes extending to the beach in Venice. One of these underground lines burst in 1954, causing a 60 X 20 foot section of Palms Boulevard, at Meier Avenue, to cave in. The water gushed down Palms for three hours, flooding the street for a mile. In 1985 the tank itself sprung a leak at an estimated rate of 1000 gallons a minute. The water poured down the alley between Grand View and Mountain View and was diverted by the fire department at Charnock west onto Grand View, where it flowed to Venice Boulevard and on to storm drains. The tank was repaired and used until 1989, then abandoned for a few years before finally being demolished. The three large homes at 3504, 3508, and 3516 Grand View were all built on the reservoir site in 2001-2004. Palms Boulevard was originally named Ocean Park Avenue; it became Palms in 1956. Across the street at 3480 Grand View was the site of an oil well with a 12-foot tall derrick. Built in February 1925 by the Union Oil Co., the wildcat well was the first ever erected in Mar Vista. Named Newlin No. 1, the well “spudded” – began drilling for oil – on February 17 and continued "
3609	Ocean	View	Champion skateboarder Stacy Peralta grew up in this 1947 house. A member of the legendary Zephyr skateboard team, the mid-70s exploits of Stacy and fellow Z-Boys Jay Adams and Tony Alva, zooming around the curved contours and lip tops of empty swimming pools, provided the impetus for modern extreme skateboarding. Voted the nationʼs number one skateboarder in 1979, Peralta appeared as himself in the 1976 film Freewheelinʼ and directed the critically acclaimed documentaries Riding Giants and Dogtown and Z-Boys. " This attractive Craftsman house was built in 1907 by a 35-year-old Norwegian woman named Hilda C. Hanson. In 1919 dentist Ralph E. Burns purchased the home. Burns was elected a director of the Mar Vista Chamber of Commerce and in 1927 became that bodyʼs second-vice president. In 1931 Burns got some unwanted publicity when a gas station attendant named Longfellow sued him for alienation of affections. It seems that Mrs. Longfellow had gone to the doctorʼs office with a lady friend to keep a dental appointment. The friend dared the gray-haired tooth yanker to kiss Mrs. Longfellow. Perhaps thinking that she wanted her cavity filled, Burns took up the gauntlet with a smooch. Mrs. Longfellow objected; Mr. Longfellow sued; and the suit was dismissed. 3701	Mtn	View	This house, at least in its original manifestation as a small bungalow, was built in 1912 by Civil War veteran Joseph D. Halbert of Pennsylvania. Known as “the sage of Ocean Park Heights”, Joe became a realtor after moving to California and opened a real estate office in the Grand View Boulevard arch. Halbert and his wife celebrated their 60th wedding anniversary on April 25, 1925 in this house; they had married two and a half weeks after Lee surrendered to Grant. Halbert died in his home in February 1934 at the age of 93." "
3664	Mtn	View	This is an interesting example of a Craftsman home made of brick. Built circa 1912, it features a hipped roof of Italian Renaissance tiling capped with decorative antefixes, a white wooden pediment, and stout fitted beams supporting the porch and porte-cochere. The beautiful stained-glass window on the north side of the house is original. You can get a great look at this house, inside and out, upstairs and down, throughout the 1982 slasher movie Slumber Party Massacre. Most of the mayhem depicted in the film was committed here." "
3628	Mtn	View	During the latter half of the 1930s through the 1940s this house was the residence of character actress Esther Dale. Esther began her career as a soprano singing with the New York Philharmonic and the Boston Symphony orchestras. She appeared on Broadway in many plays, including the title role in “Carrie Nation” with a young Jimmy Stewart. She moved to Hollywood in 1935 and over the next quarter century played character roles in over 100 films. A dark-haired, dumpy woman with a flinty exterior, she excelled as sharp-tongued dowagers, bossy servants, and brutal prison matrons. She acted with such major stars as Humphrey Bogart, Spencer Tracy, and Cary Grant; among her directors were Alfred Hitchcock, William Wyler, and Howard Hawks. Esther died in 1961 at the age of 75 ." 3543	Inglewood	An Italian-born barber named Guy Crocetti and his wife Angela bought this house in 1950. The year before, their son Dino appeared in a movie for the first time. Dino was better known by his stage name, Dean Martin. Angela was active with the Italian Womenʼs Club and rated high with that organization by consistently persuading Dean to entertain at their annual charity dinner dance. Mrs. Crocetti died on Christmas day in 1966. Guy passed away in this house the following August at the age of 72." 3581	Mtn. View	In 1913 “one of the most pretentious homes on Mountain View Avenue” (Venice Vanguard) was built on this half-acre site. The double-wide bungalow had parallel gable roofs, an interior courtyard, a reception room, and a library. A wealthy 26-year-old divorcée from Ohio named Marie Briggs “Peggy” Cole snapped up the place for $3,500. She added a tennis court, a profusion of shrubs and flowers, and a dog kennel in the rear which housed her wolf hounds and “Rags”, a trained movie dog she bought from Cecil B. DeMille. Two years later the “elaborately furnished” house would be the scene of a bizarre suicide and attempted murder.